This program is for Stow-Munroe Falls residents or those who attend Holy Family School. No experience is necessary for a child to participate. play in games to gain experience, confidence, and to have fun! All players play at least half of the game. Each player receives a t-shirt. This program will provide K-2 boys and girls with the opportunity to participate in weekly skills sessions where they will learn and practice basic skills in a group setting. Games will be played at the end of each weekly session. No parent coaches for this league. Instruction will be provided by Stow Travel Basketball, under the direction of Coach Matt Spiegel. K-1 9 a.m. – 10:30 a.m. K-1 9 a.m. – 10:30 a.m.
Gr 2 10:30 a.m.-12 p.m. Gr 2 10:30 a.m. – 12 p.m.
Gr 2 10:30 a.m. – 12 p.m. Gr 2 10:30 a.m. – 12 p.m.
K-1 8 a.m. – 9:30 a.m. K-1 8 a.m. – 9:30 a.m.
Gr 2 9:30 a.m. – 11 a.m. Gr 2 9:30 a.m. – 11 a.m. The first 45 minutes will be drills/skill work lead by Stow Travel Basketball coaches. The last 45 minutes will consist of game play. Stow Parks and Recreation will provide each player with a t-shirt. We will not keep score. Coaches will call all fouls. Our goal during game play is to keep it fun and instructional! 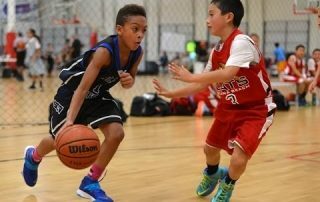 Boys in grades 3 through 6 will be placed on teams according to grade. Enrollment will determine division of boys teams. Practices begin the week of October 29 and will go through January/February 2019. One practice will be held each week for one hour. Practice schedules vary for each school and will be assigned once registration is complete. Each child will be informed by their coach of his/her practice schedule. Games are on Saturdays beginning December 1, at Kimpton and Lakeview. Girls in grades 3 through 6 will be placed on teams according to grade. Enrollment will determine division of girls teams. Practices begin the week of October 29 and will go through January/February 2019. One practice will be held each week for one hour. Practice schedules vary for each school and will be assigned once registration is complete. Each child will be informed by their coach of his/her practice schedule. The season will begin October 29th and run through the end of January. Games are played on Saturdays beginning December 1, at Kimpton and Lakeview. Click here for more information regarding open school dates. Click here for sample Guide to Practice Plan. Stow Parks and Recreation will work hand in hand with Stow Travel Basketball as they implement the youth travel basketball program for our community to ensure that the program fits appropriately into the bigger youth basketball picture. Stow Travel Basketball will be offered to youth in grades 3 through 6. Players must be registered and play in Stow Parks & Recreation to try out and be selected participate on a travel basketball team. Once selected, the player will then register for the Travel program. Tryout dates will be set and information about this will be distributed through the schools. Please check back with Stow Parks & Recreation or Stow Travel Basketball if you do not receive information through the schools. Teams are made up of men who live within the City of Stow or are employed by a company located in Stow. Teams play eight games each, plus playoffs if they qualify. All games are played at Kimpton Middle School Gym. The season begins Wednesday, November 14, 2018.